Adopting running as a new hobby can have important benefits, including increased cardiovascular health and the potential to drop unwanted weight. Beginner runners might be unsure of how to track progress, especially if gains are small at the beginning. Using the mile rate to track progress isn’t a bad idea since it can help you measure your increased speed over time. There’s no set definition for a “good” mile rate, though, since factors such as age and gender come into play. Using data from two 2011 Southwestern Medical School studies, researcher Dr. Jarett Berry determined that for men in their 50s, running a mile in eight minutes or less translated to “high” fitness levels, running a mile in nine minutes or less translated to “moderate” fitness levels and running a mile in 10 minutes or more translated to “low” fitness levels. “High” fitness women ran the mile in nine minutes or less; “moderate” fitness women ran it in 10 minutes and 30 seconds or less and “low” fitness women needed 12 minutes or more to complete the mile. Run for Life states that a 10-minute mile rate is good for beginners; the goal is to complete 3 miles in 30 minutes. If a 10-minute mile rate seems out of reach, start with a 12-minute rate and then work downward. Beginners can create their mile benchmark by running a committed but not overzealous mile. Achieve that first benchmark time without treating it as a “race” since it won’t be an accurate measurement of how fast you’d typically run a mile. Racing can lead to injury if you haven’t been running regularly. 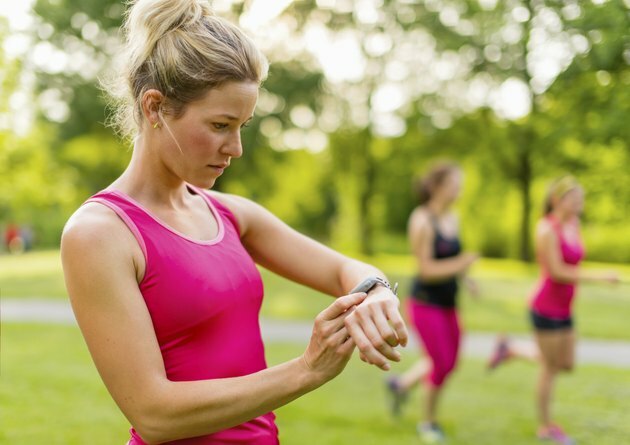 Note that time so that you’ll be able to see improvements as you progress in your running practice. One mistake that beginning runners make is treating their first mile like it’s the only mile, according to Run Addicts.net. Although a great mile time might make you feel satisfied, you might have spent all of your energy clocking that first mile when you still have additional miles to complete. Your mile rate is more of an average; for example, if you run 3 miles in 24 minutes, the rate is eight minutes per mile. Keeping up a steady pace over extended lengths might have more payoffs for you than achieving a brisk mile and then being unable to complete additional miles. Although using a good mile time as a benchmark will help you measure growth, it’s not the only way to track your progress as a beginner runner. Try to reach between 20 and 30 minutes of running, three to five times a week, to accrue positive benefits associated with this fitness activity. Take walking breaks as needed, and don’t strain your body since this can result in injury. After maintaining your running practice schedule, you can try another timed mile to see if your rate has improved.